Angie in T.O. : HELLO? IS ANYBODY THERE? I remember the first time my BlackBerry rang, someone was calling and I had no idea how to answer it! Who calls anymore? Email, text and Facebook seem to be the way to stay in touch these days. I do all 3, I like the convenience, and having the easy connection with friends and family all over the country. But something that use to be normal happened this week, and it had a ripple effect. I had girlfriends call me on my land-line a couple nights this week! I could actually hear their voices and their laughter instead of reading LOL. I enjoyed these conversations on the phone so much, I telephoned other girlfriends throughout the week in the evenings, and called some family members too! 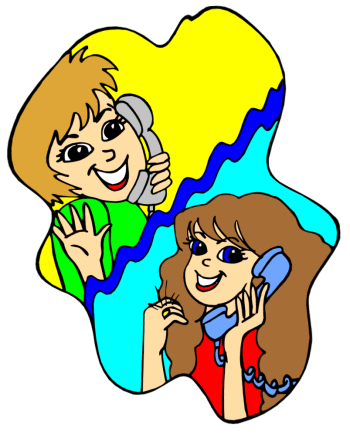 I enjoy social media, and text and emailing have their place, but having a good chat on the phone can do wonders, and I think I will start doing that a lot more. NOTE: No blogs for a week or so, I'm on vacation and off for the fun and sun of Orlando! PRINCESS GRUMPY WINS A PRIZE!